The space men were from Toys R Us for £1 each. For such cheap figures, they are incredibly well articulated and come with helmets, back packs and weapons. The Alien figure is from Takara's micromen range and is incredible, with super articulation and tons of accessories including the alien egg (closed and open), face hugger and chest burster. This is the one and only appearance of my sloppy 10th Doctor custom as the official CO one was released barely six weeks later. Part One was originally shown new year's day 2006 a week after the 10th Doctor's on screen debut with part two following in February. 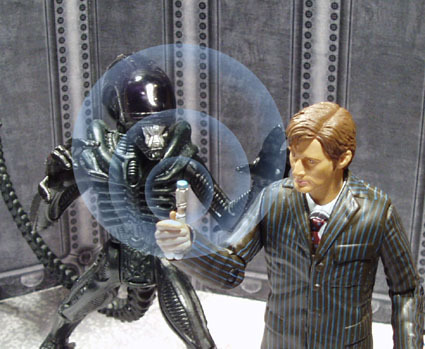 Following the pattern of the TV series, the two episodes were given different titles with part one named THE BLACK HOLE and part two being THE DOCTOR V ALIEN. The original was accompanied by a brilliant cover by Luke Spillane. In 2007, this story was taken down with the entire AFT site and as the only 10th Doctor story not to use the excellent official CO figure, I wasn't keen for it to sit along side the other stories. It was finally restored on 23 November 2011. 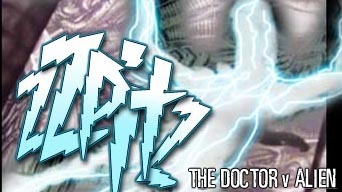 Two things made The Doctor v Alien come about. The first was the absolutely brilliant Takara figure of Alien. They also made a super articulated Predator figure that went on to battle Batgirl on the AFT. I don't normally do crossovers like this but since it was Christmas, I felt I could get away with it for one story. It was supposed to be a frivolous single parter but it quickly became apparent that it needed the length of two episodes to do it justice. The other reason was the new Doctor. When Christopher Eccleston debuted on TV as the 9th Doctor, the AFT was right there on the first night with it's own 9th Doctor story and I wanted to do something similar for the 10th Doctor to celebrate. The sets were photoshop printouts. The human ship interior had been designed from scratch while the alien ship uses art from HR Giger, the designer of the alien. They were lit from above and behind to give a spooky atmosphere. I considered reshooting it using 5" figures and rescaled the sets accordingly. But with so many better stories to be made, it never happened. For your pleasure, I've added the 5" versions of the sets to the AFTDownloads site. The original story ended on a bit of a cliffhanger with the Doctor and Rose wondering who was sending the alien to Earth. The answer is given to the audience as we see the side of the ship with the word Shadow emblazoned across it. shadow arc and all references to it were taken out. When returning the story to the site in October 2011, I discovered that I still had the basic pages without lettering and took the opportunity to redo it with some minor changes to better reflect the characters of the Doctor and Rose. And to remove a previously overlooked typo (right). Does it count or not? It's up to you whether you accept a crossover like this into the Doctor Who cannon.